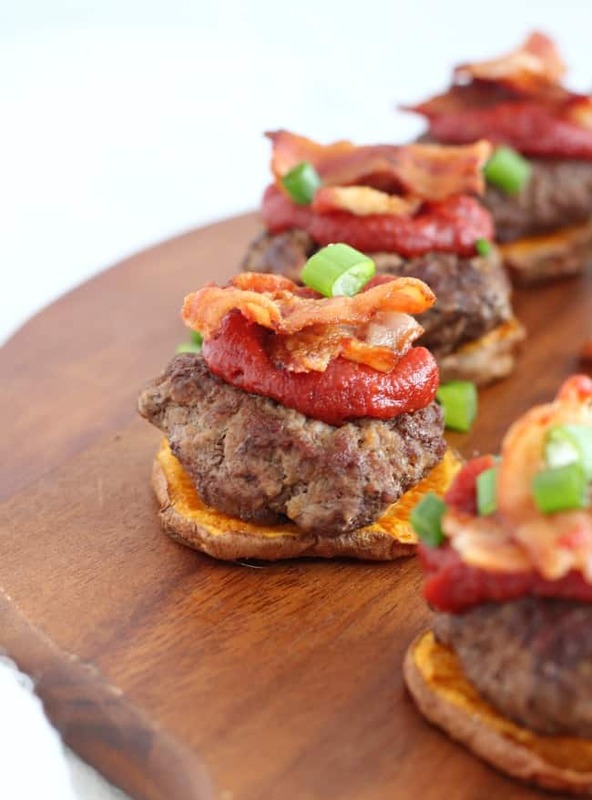 The perfect mini burger bites full of all your Paleo favorites! 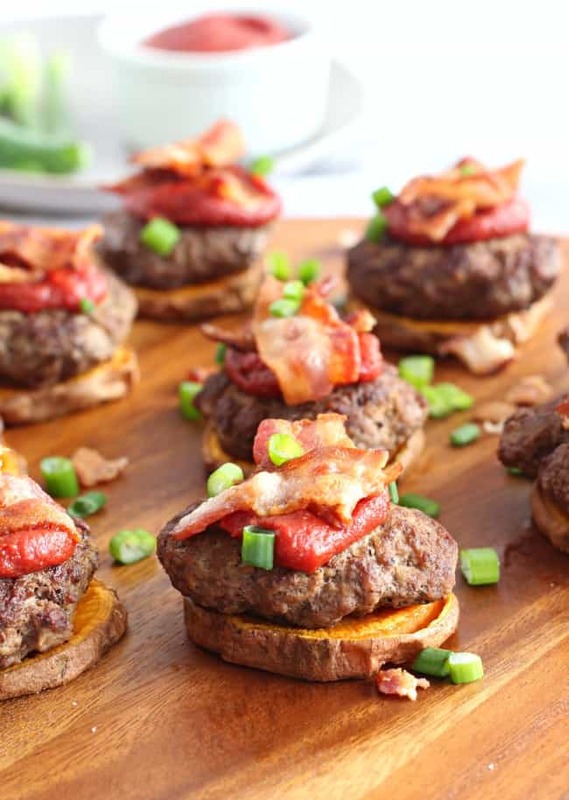 Crisp roasted sweet potato rounds are topped with mini burgers, bacon, maple chipotle ketchup and green onions for the perfect touch on these Sweet Potato Bacon Burger Bites! Serve as an appetizer, snack, or fun meal. Paleo, grain free, dairy free, gluten free. 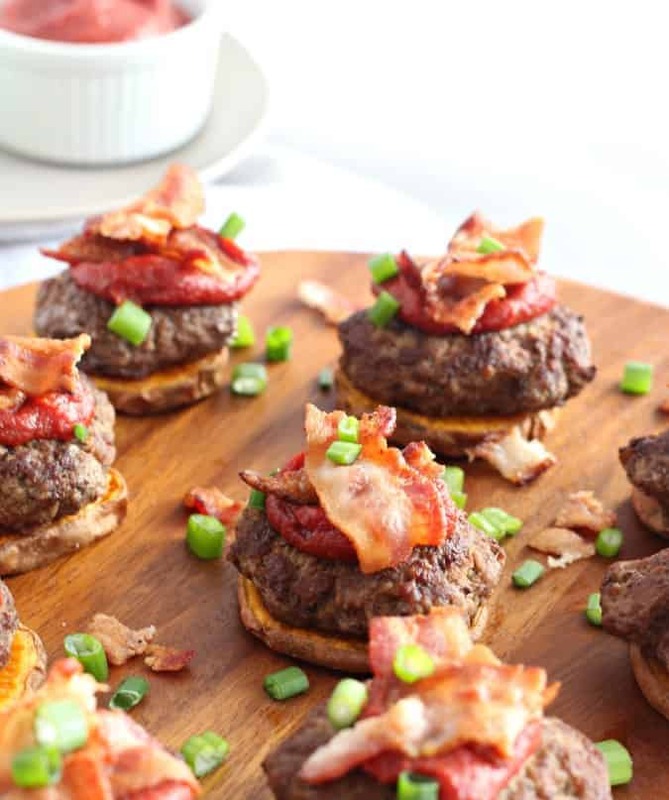 The kids and I voted on what to call this recipe – burger bites or sliders? Drew wanted sliders, the girls said burger bites and I never really made up my mind, but went with the majority. What is with me and recipe naming angst? If only Adam had been home to vote as I was finalizing the Pinterest image, maybe I wouldn’t still be stressing about it. Silliness, really. 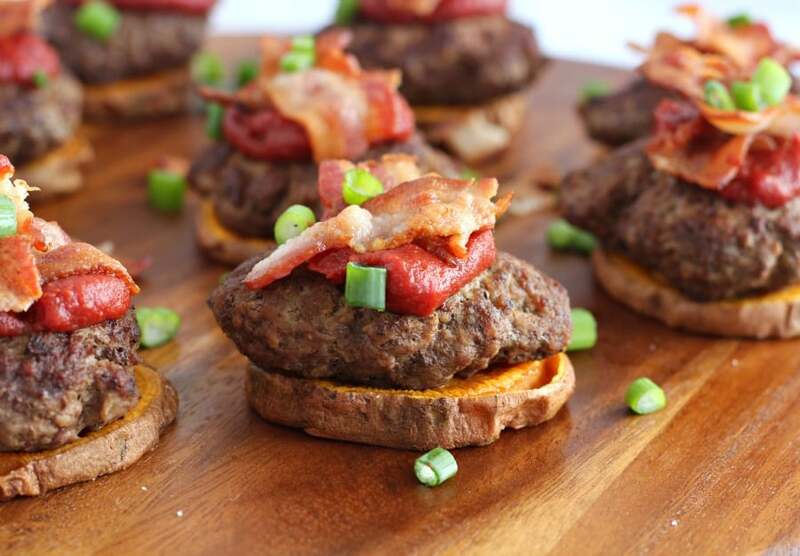 Like I mentioned yesterday, the recipe title wasn’t the only thing I was angsty about with these Sweet Potato Bacon Burger Bites. I was also stressing about the sauce I’d use. It was between my Maple Chipotle Ketchup and Chipotle Ranch Mayo. Yup, I have a chipotle chili flavor obsession so at least that part wasn’t an issue. Adam was telling me to go with the mayo, but, ultimately I went with the ketchup because I think it appeals to more people (no raw egg), plus it’s the easier of the two sauces to make – which makes a difference when you’re cooking up a multistep recipe like this one. Not that it’s difficult, but I’m all about simplifying things as much as possible while still making food that’s delicious and addicting in the all the best ways. Aside from FINALLY making this recipe that’s been nagging me for weeks now, I’m in a very good mood today and it’s all about RELIEF! First, I’m relieved because everyone is healthy, for now, and (KNOCKING ON WOOD) the worst of that stomach bug is over with. Second, I picked up a kindergarten registration packet today for Drew, and can’t believe I’ve officially made it out of the baby and toddler years alive and still almost breathing. To have three babies, and then watch them one by one grow out of actually being a baby, is mind-blowing. Those were amazing years of growth for all of us as a family, and while I sometimes miss the baby days, I can’t say I’d want to go back there because it was just so dang hard. Every day, hard – no rest, no perspective on when things would change and I’d be able to sit, alone, as I am now, without a tiny person on top of me, another one screaming for me, and probably a third spilling something or drawing on furniture. It’s definitely a bittersweet feeling, but, it’s a nice one to have, and I’m excited to see how I feel about it 5 years from now! It’s a fun place we’re in right now – I can talk to my kids about things we all enjoy, they actually think I’m cool and want to hang out with me but aren’t clingy, they like the food I cook (and think Paleo is awesome) and they believe all (or most) of what I tell them and ask for my opinions. They also trust me and tell me every detail of their days for what seems like hours after school! I know this doesn’t last (I clearly remember being a teenager) but I’m going to try my best to hang on to all of it as long as I can. If all else fails, I’ll continue to bake and cook for them and hope that wins me at least a few points. Truthfully, since the world is so different now than it was 20 years ago, I have no idea what I’m in store for in 5 and then 10 more years. Maybe it’s because I had extra coffee today or that I happen to be in a great mood, (um yes) but I’m only feeling excited about seeing the changes in our family over time. A random non-anxious moment for me – woohoo! Now onto the recipe! 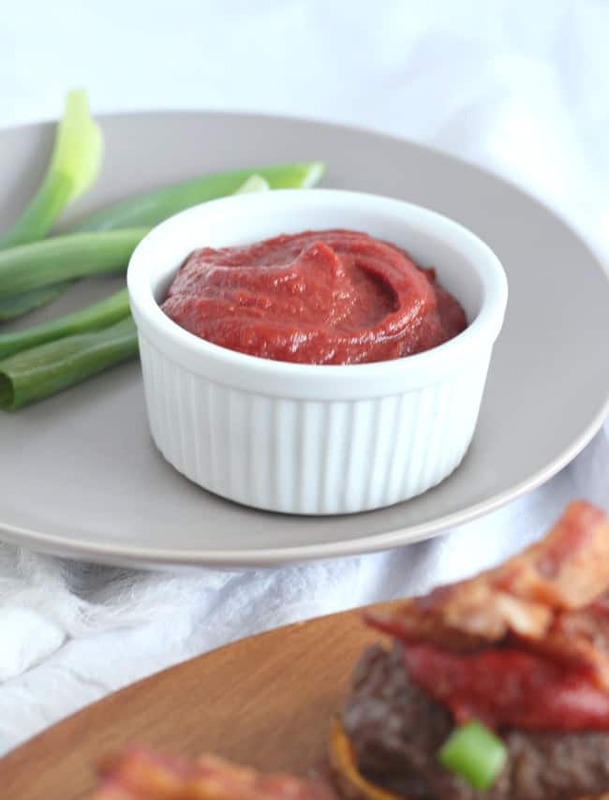 1/2 cup of myMaple Chipotle Ketchup recipe it's easy! Prior to beginning, make the Maple Chipotle Ketchupto have it ready to go! Then, prepare to roast the sweet potatoes. Line a large baking sheet with parchment paper and preheat your oven to 425 degrees. Lightly brush each round with olive oil on each side. Place them on the baking sheet and lightly sprinkle with sea salt. Roast sweet potatoes in the preheated oven for 30-35 minutes, flipping once in the middle of roasting to evenly brown. They are done when the outside is lightly browned and the inside is soft. 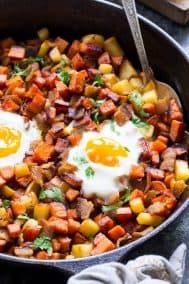 After putting sweet potatoes in the oven, fry the bacon slices over med-hi heat in a large heavy skillet until crisp, then remove and drain on paper towels. Discard the bacon fat, or save it for later use. In the same pan (bottom can still be coated with bacon grease) lightly sprinkle sea salt over the bottom and turn the heat back on to med-hi. When the patties are done, place them on a plate before assembling. 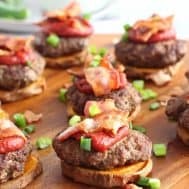 To assemble, place roasted sweet potato rounds on a large serving platter and top with a mini burger, a dollop ofMaple Chipotle Ketchup and a piece of bacon folded in half and criss-crossed, then sprinkle thinly sliced green onions over the top. This recipe makes 10 servings but is easily scaled for whatever amount you want. Serve right away and enjoy! *I had to do this in two batches, but you could also use a second pan to save time. What’s your mood like right now? If you have kids, what stage are you in with them right now? How have things changed? What’s your favorite topping, dip, or sauce with a burger? 12-18 is such a big changing time for both girls and boys! Can’t imagine. I’m just happy we still have a few years before middle school. I remember eating something similar when I was doing the Whole30 and they were so good! I am glad you went with the ketchup, that would have been my vote:) I definitely need to make these soon! I am already scared of having teenagers because I know how difficult I was as one…. They’re fun and you can make them bigger for a meal if you want 🙂 I’m happy my kids will have each other as teenagers because I feel like at some point they won’t be telling me all that they do now! These look so good and I don’t even eat red meat! My mood right now is exhausted. This week was crazy between my computer crashing, sponsor deadlines and starting school it was just a lot. I wish it was Stutday already! I totally feel you, especially after dealing with the computer crash a few weeks ago – not quite over that yet. Plus now I’m marathon training so not even feeling relieved by the weekend! I think I need more coffee today..
My little one is 6 and I found it to be a wonderful age… Old enough that I can go to the bathroom alone (yeah!) but young enough to think that his mommy is a princess haha I will totally enjoy it while it last! I need to get back on mustard! I love honey mustard and I also of course use mustard in my mayo! It’s under appreciated! I’m glad that you are free from Super Bowl recipe purgatory, and what a recipe it is! You could almost call them ultimate loaded potato skins 😀 Either way, I am going to noms them. I was on the fence with doing actual skins! I’ll have to do loaded skins though at some point, maybe with some sort of bbq filling. Favorite dipping sauce – maple mayo. Sounds weird, but it tastes amazing! If you have a recipe I’d love to try that! Ketchup approval! I’ve been eating it all week actually 🙂 And oh the long road – wonder what I’ll be saying in 10 years. I love spicy ketchup! 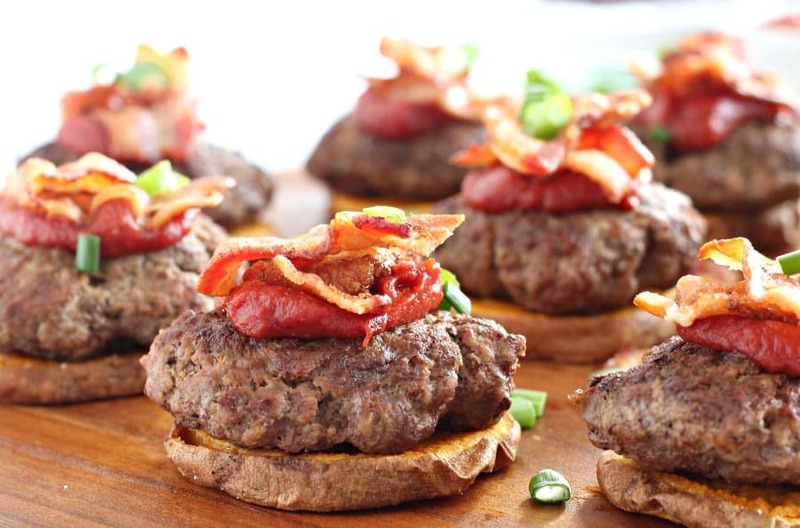 I would actually watch the Superbowl if it meant eating these burger bites! I think burgers need to be on the weekend menu now. You can make bigger ones for a meal 🙂 I will likely be doing that next time I make these! I’ve been on a ketchup kick ever since making this. These look so amazing! Going to have to try these out! They are simple and really hit the spot – hope you like! Haha yes naming a recipe is so hard especially when you want the post to be called one thing, the dish to be called another, and you want it to be most descriptive on pinterest! I love the idea of putting bacon, green onion, and maple chipotle ketchup with these! I still haven’t made paleo ketchup because it use to be my favorite condiment that I put on everything and since I haven’t had it in a year and am doing okay I’m scared that I’ll go crazy with it if I start back! I’ve never made a Whole30 ketchup but I really like the maple version. It’s still addicting though, I hear you! My husband and I were just discussing that bacon truly does make everything better. Thanks for sharing these. Yum!! These are my actual dream–its everything i love at once. thank you!! I’ve still been meaning to try that ketchup of yours. I love the maple-chipotle combo, and I love that it’s low-FODMAP. It’s nice that your kids are at a good age and supportive of you–that’s really a blessing. 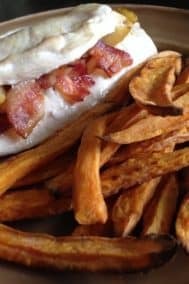 I’m new to your blog, and am already drooling over your recipes!!!! I have 2 daughters, 16 and 9 and they sure are keeping me busy. The teen years I am learning are the toughest so far! Welcome and thanks! I can’t imagine what’s to come with two teenage daughters just 18 months apart – I’m hoping somehow they help each other out even when they’re hiding things from me – oy! These look great and are definitely something I could make with my niece… and eat! 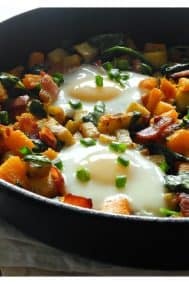 Great idea with the sweet potato. I’m sure she’d love to help! YUMM these are making my mouth water 🙂 Sweet potatos are my jam and that maple chipotle sauce sounds to die for! Same here, I love that ketchup for so many things! Thanks!